This house has it all! Location, upgrades, large living areas! 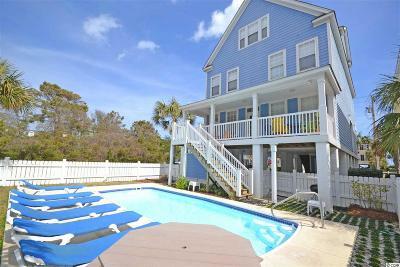 Welcome to Lazy Flip Flop, your beautiful second row beach home! Located directly across from a beach access, this home is literally just steps to the beach! With 6 bedrooms and 6.5 baths there is always room for friends or family. Porches on all 3 levels on the front to feel the ocean breeze or enjoy the large porch on the back over looking your private pool. Huge kitchen with granite countertops and stainless steel appliances and plenty of eating space in the dining room, breakfast room or kitchen bar! The second floor has its own mini-kitchen and living room. Each bedroom has it's own bathroom and flat screened tv! This home sleeps up to 18. Don't miss this great beach retreat!